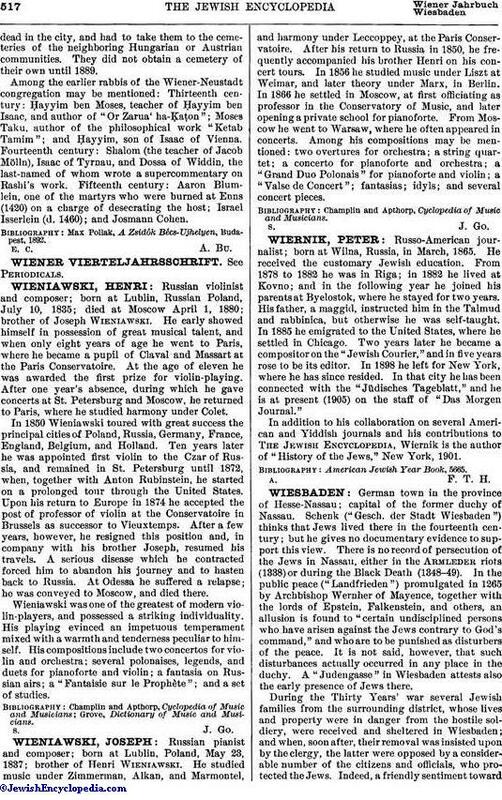 Russian violinist and composer; born at Lublin, Russian Poland, July 10, 1835; died at Moscow April 1, 1880; brother of Joseph Wieniawski. He early showed himself in possession of great musical talent, and when only eight years of age he went to Paris, where he became a pupil of Claval and Massart at the Paris Conservatoire. At the age of eleven he was awarded the first prize for violin-playing. After one year's absence, during which he gave concerts at St. Petersburg and Moscow, he returned to Paris, where he studied harmony under Colet. In 1850 Wieniawski toured with great success the principal cities of Poland, Russia, Germany, France, England, Belgium, and Holland. Ten years later he was appointed first violin to the Czar of Russia, and remained in St. Petersburg until 1872, when, together with Anton Rubinstein, he started on a prolonged tour through the United States. Upon his return to Europe in 1874 he accepted the post of professor of violin at the Conservatoire in Brussels as successor to Vieuxtemps. After a few years, however, he resigned this position and, in company with his brother Joseph, resumed his travels. A serious disease which he contracted forced him to abandon his journey and to hasten back to Russia. At Odessa he suffered a relapse; he was conveyed to Moscow, and died there. Wieniawski was one of the greatest of modern violin-players, and possessed a striking individuality. His playing evinced an impetuous temperament mixed with a warmth and tenderness peculiar to himself. His compositions include two concertos for violin and orchestra; several polonaises, legends, and duets for pianoforte and violin; a fantasia on Russian airs; a "Fantaisie sur le Prophète"; and a set of studies. Grove, Dictionary of Music and Musicians.